Enjoy a fantastic tour with your significant other this Valentine’s weekend! 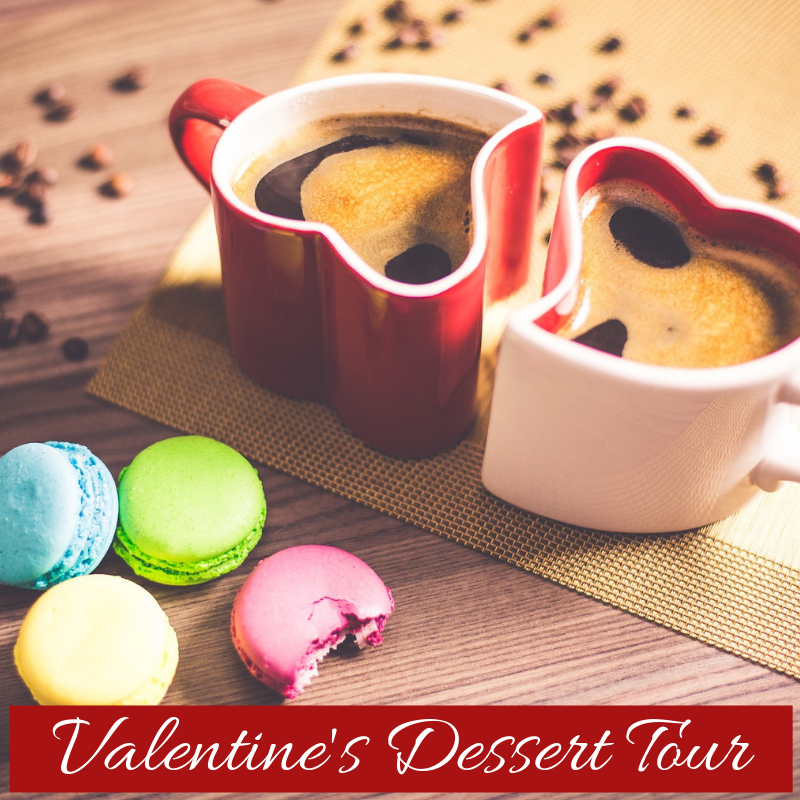 We’ll be stopping at 5 top secret locations to sample decadent desserts and ending with a champagne toast and roses for the ladies! Only two tours so space is very limited, book early! Did you know we offer private tours? 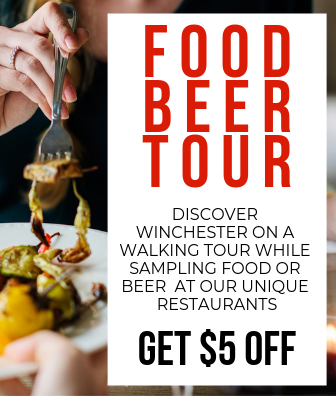 We can plan a tour for your large group whether you have vendors coming into town and need to entertain, are planning a girls weekend or bridal shower, or just need a place to hang with your family and friends we can put a private tour together for you that introduces you to Winchester and our fantastic restaurants and breweries. All on your schedule! Reach out to get more information! Coming 2019! We are teaming up with the Discovery Museum to offer a kids food tour and play time! We’ll introduce you and your child to several international cuisines while we learn fun history facts about Winchester, and then you’ll be off to the museum to work off all your energy! Stay tuned! Reach out to get more information! The tour was fun, delicious, and informative. We are our way through the walking mall and got to try new places and new dishes. We loved Misty and Anthony who were our guides. It was an awesome day date! Exact location will be provided on your tickets. Yes – we need to let our breweries and restaurants know how many tour guests to expect so tickets must be purchased at least 4 hours in advance. Are children welcome on the food tour? Absolutely! We suggest children be at least 10 years old, but parents are welcome to use their judgment for their own children and whether they can handle a three hour tour. Participants may reschedule their tour for a new date with 7-days’ advanced notice. There are no refunds. Participants are expected to behave respectfully to others including, but not limited to guides, other tour participants, members of the public, and towards the property of others, including but not limited to shared facilities and public environment. Participants are expected to obey all local, federal, and Commonwealth of Virginia laws. Violations of any law is grounds for dismissal from the tour without a refund. Drunk and/or Disorderly Conduct is grounds for dismissal from the tour without a refund. 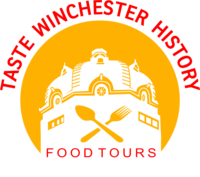 Taste Winchester History reserves the right to stop a tour if participants violate the Code of Conduct. No refund will be given, and the participants must pay the full compensation for any damages that might have been caused. This Code of Conduct is outlined as such and serves as a guideline for all Taste Winchester History participants to follow.  We want all participants to have a fun and interesting time and enjoy what Winchester, Virginia has to offer. Your cooperation and patronage are appreciated. We stay within two blocks of the Old Town Walking Mall. Total walking is about a mile as we traverse the mall. We will be indoors for most of the tour but will be walking outside to get to the next destination and for quick historical and architectural stops, so please wear clothes appropriate for the weather, and bring an umbrella if rain is in the forecast. Is this tour good for local Winchester residents? Absolutely! We tend to find that the closer we live to something the less we explore! Locals will learn new things, and our restaurants often offer new menu items to our guests. Can I schedule a private tour?